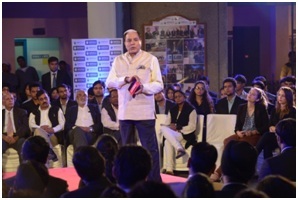 Birla Institute of Management Technology (BIMTECH), Greater Noida hosted the famous “Dr. Subhash Chandra Show” on December 3, 2014. 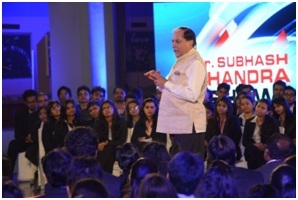 Dr. Subhash Chandra is an Indian “Media Mogul” and the chairman of Essel Group, an Indian conglomerate and the Zee network. He launched the country’s first satellite television channel Zee TV in 1992 and later the first private news channel, Zee News. The topic chosen for the discussion was “Success of new entrepreneurs in the corporate world”. The format of the discussion was quite interactive and the students of BIMTECH got an opportunity of a highly invigorating interactive session with Dr. Chandra. The show started with Dr. H. Chaturvedi, Director (BIMTECH) extending warm welcome to Dr. Subhash Chandra. Dr Chandra took the show forward with an introduction about his life and how he started his professional career. He emphasized that even after getting placed from the campus a student’s career objectives are not met. He pondered upon the importance of practical knowledge over theoretical knowledge that students derive from the books. He gave six key points through which one can become successful in the professional world. According to Dr Chandra one should never believe that success is constant, a person should have a clear idea about his role and responsibilities in an organisation, seeking cooperation from seniors and colleagues in an organisation is of utmost importance and the fact that despite challenges we should always stay motivated. In his view, one should know his strengths to market himself successfully in the present scenario. Proactive nature is vital for one’s career growth. During the question and answer round, Dr. Chandra shared a past experience when he was given an offer to sell his organisation in 1995 and he said one thing to the buyers that “India is not for sale”. He also said that success is not guaranteed. He gave the example of ICL (Indian Cricket League) which was an initiative taken by “Zee” to provide BCCI with young and raw cricket talent from across the country. He told the students to follow their passion. The session concluded with the discussion on talk about women empowerment and the changing roles of women in the organization. The curtain was brought down on the humorous topic of entertainment and how for every individual the perspectives are different.